I was introduced to articulated streamers several years ago when Charlie Summerville, owner of Alaska Adventures Lodge, visited our fly shop to give a presentation about fly fishing on the Alagnak River. Following his visit, I tied as many articulated streamers as I could for anglers traveling to his lodge that summer, and also managed to tie a few for my fishing trips on the Susquehanna River. The results were impressive, and the large jointed streamers became standards in my Alaska and warmwater fly boxes. Years later, I still catch my largest trout, salmon, northern pike, and smallmouth and largemouth bass using articulated streamers, and I've found a few excellent ways of making them. Articulated flies work well because their wiggling, writhing, and twisting movements as they settle between strips makes them look like injured prey items, which is much more attractive to predatory fish. There is little need to add joints to small drys and nymphs, but jointed flies excel at imitating large prey items such as long swimming aquatic insects (Hexagenia and Isonychia), or baitfish and other swimming food sources such as leeches and sculpins. A long-shank hook looks rigid and unnatural. A short-shank hook with a long extended body and tail results in too many short strikes. The answer is a long, flexible fly with the hook in the rear. Methods of articulation have evolved for the better since I was first shown how to lash two hooks together with gel-spun backing, but one thing remains constant—these flies are extremely effective. As a guide I get to see and learn about tons of fly patterns, tying, and fishing techniques used all over the world. When speaking with anglers about articulation, I am still surprised that many consider articulated streamers to be too big for their home trout streams. I think this comes from a belief held by many fly fishers that trout are delicate creatures that mostly eat tiny morsels, and only occasionally small fish and crayfish. At one time I had a similar view, but that changed one day when I used one of my Chain Reaction Leeches—made for a trip to Alaska—to fish a deep pool on Pennsylvania's Little Lehigh Creek. While jigging the streamer close to my feet to watch its action, I was amazed to see a 10-inch trout attempt to eat the streamer even though it was nearly half the length of the little fish's body. The trout grabbed the fly and shook it, then let go and grabbed it from a different angle like a dog chewing a bone, and continued to do this a few more times before swimming away only to return to try and eat it again. It was then that I realized that trout, like bass and most other predators, will try to eat any food they can fit in their mouths. I also realized I needed to use smaller hooks both to increase my chances of a hookup, and also to protect smaller trout. There is not much difference between the articulated streamers I use for trout and those I use for bigger fish—just smaller hooks and thinner connection materials. I am a firm believer that big flies catch big fish. However, problems arise when attempting to tie a truly large streamer on a single hook shank. I tried at one time to tie some streamers on 10X long hooks but they had two major faults—poor leverage and a lifeless, rigid appearance. Long streamer hooks give the leverage advantage to the fish, and any rolling, twisting, or jumping tends to twist long-shank hooks out of a fish's mouth. Short-shank hooks are much more effective at keeping a fish on the line. Articulation solves these problems but presents a new challenge—increased fouling of the fly and line/leader. Anglers who are not used to hurling a 5-inch streamer—and the sinking-tip line that usually goes hand-in-hand—need to practice smooth casting strokes and long pauses to allow the line to straighten and avoid tailing loops. Tailing loops often cause articulated streamers to foul. Learning the simple water haul technique allows even novice anglers to fish these patterns with a sinking-tip with little trouble. No matter which method you choose, adding articulated flies to your boxes brings a new facet to your fishing arsenal. Whether you are fishing articulated nymphs or streamers, the added movement and better leverage leads to more fish landed, and greater confidence when fighting salmon, steelhead, bass, and other large gamefish. The hook-to-hook method is the easiest place to start, and is probably the most widely used articulation method. It requires one vise and no special tools, and is useful for constructing streamers, nymphs, and even dry flies. In a nutshell, the rear portion of the fly is tied on one hook and then a length of monofilament, fly line backing, or wire is looped through the eye of the hook and then lashed to a forward hook shank with the hook bend removed. Substitute a Waddington shank for the forward hook if you want to eliminate the sharp edge that results from cutting the forward hook shank, but you will have to tie the forward section of the fly with the vise in a sideways position, which may be awkward at first. A few years ago, fly tier, guide, and author Kelly Galloup (slideinn.com) began placing beads on the loop used to join the two sections, which gave the streamers more movement and made them less prone to fouling. You can use plastic, glass, or metal beads but be careful with metal beads when using fly line backing, because they sometimes have sharp edges that can wear through the material. Plenty of trophy fish have been lost to backing failures, so it is best to take every precaution against this. Fly line backing gives the fly more movement, but Dacron breaks down over time. Wire and heavy nylon monofilament are more durable but less mobile. When tying smaller articulated nymphs, use finer monofilament or wire to complement the finer-diameter hook shank. When using the hook-to-hook method, I usually use 20- or 30-pound Dacron backing. Despite the higher tensile strength of gel-spun backing, Dacron has more abrasion resistance and is more durable because of its thicker diameter. For heavy-duty flies, use 15- or 30-pound American Fishing Wire, depending on the situation and hook size. Jointed flies made with wire and Dacron backing have failure problems. I remember my fly-fishing mentor Joe DeMarkis lamenting that he lost a trophy trout in Alaska due to the joint failure in an articulated fly I tied for him. Worse still, he unknowingly continued fishing the hookless front half of the fly, losing countless other opportunities. The articulated leeches I used at that time were tied hook-to-hook using 35-pound-test gel-spun backing. As tough as gel-spun backing is, repeated sawing by the teeth of a trophy rainbow, coho, or other gamefish will eventually weaken it. My search for an alternative led me to a tackle shop, where I quickly became interested in the tools and wire used to build in-line spinners. Using a Dubro Kwik Twist tool, I made Waddington-style front shanks from .026" spinner wire forms. The first streamers I made in this fashion were tough, but lacked the movement of the hook-to-hook versions tied with backing. Eventually, I found Daiichi 2141 hooks with a straight looped eye, which worked perfectly with the custom front shanks to create a free-moving joint similar to that you'd find in a Rapala. Flies tied with the Chain Reaction method have plenty of movement, resist fouling, and are much stronger than any other articulation method I know of. The stainless steel wire used for the front shank has a breaking strength of about 140 pounds. It is strong enough that on straight pull tests, a #1 Daiichi 2141 rear hook would bend out without the front wire even bending or deforming. The rear half of my Chain Reaction streamer continues to move freely when being swung or between strips, because the joint has more freedom of movement than the other methods. It is important to make sure that the wire used for the front shank is not too thick for the eye of the rear hook. If the wire is too thick, it impedes the movement of the joint. String Leeches have a long rabbit Zonker strip for a body, and a separate long loop of backing with a hook on it, which creates two problems. First, a fly tied in this fashion can foul easily, and the problem increases as the backing loop gets longer. Also, you can miss strikes if the hook is not near the Zonker strip when the fish strikes it, and this is frequently the case due to the weight of the hook and relative buoyancy of a Zonker strip. Derek Fergus (20sub3.com) solved these problems with his Strung-Out Leech. He builds the body of his fly around the backing material, which gives the fly excellent movement and keeps the hook exactly where you need itâ€”at the tail of the fly. This method has been used for nymphs, streamers, and large dry flies with excellent results. There are a few common mistakes when tying flies with this method, but they are easily overcome. Using too many wraps of material stiffens the fly and limits its movement. Using stiff backing for the loop also decreases the movement of these patterns. Some tiers leave a long loop of backing at the rear to attach the hook with a lark's head or cow hitch. The long loop leads to increased fouling, but allows you to switch hooks to suit different fisheries. Super Glue is crucial for tying Strung-Out flies. It is not a substitute for good tying techniques, but aids in durability and allows you to add material with few wraps and as little bulk as possible. It is necessary to use two vises when tying these patterns. A spring-type vise, like a Regal with the head tilted straight up, allows better access to the front hook and makes the task easier. Weight. 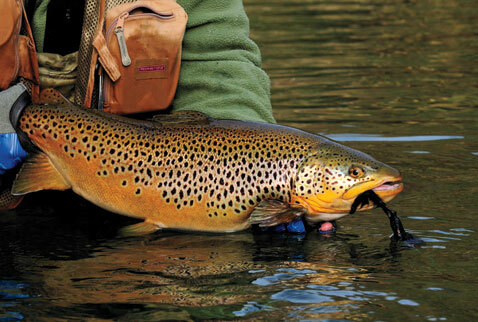 If, where, and how much weight you use has a huge effect on the behavior of your streamer in the water. A heavy streamer nosedives when you stop stripping it. The same pattern tied without weight might swim more naturally but is ineffective unless you can get it down to the fish. Hook position. In some fisheries it makes sense to leave two hooks intact on an articulated streamer. In other places it might be illegal. I favor a hook only in the rear, but with some species like pike or musky, a second hook up front can be an advantage. Always check that you are in compliance with fishing regulations. Wire, backing, or kevlar? The materials that form the skeleton of your articulated fly can make the difference between a blockbuster day and a haunting disappointment. A musky or bluefish might saw your streamer in half if it was tied with fly line backing instead of wire. Plus, backing deteriorates over time. However, wire is less flexible and jointed wire flies don't move in the water as well as those constructed from backing. Experiment. Flies never look the same in the water as they do in your vise. A sink, bathtub, or aquarium is helpful when developing new articulated flies. Tim Skoraszewski guides for Rivers Outdoor Adventures (riversflyfishing.com). His Chain Reaction Leech is available at orvis.com.